“X Factor” fan favorite Emblem3 have inked a deal with Syco Music and Columbia Records, the labels announced on Wednesday. News of the deal shouldn’t come as a surprise to viewers. 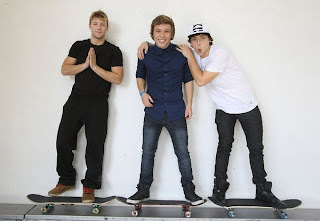 Week after week, the young Huntington Beach trio made up of brothers Wesley and Keaton Stromberg and best friend Drew Chadwick made teenage girls swoon with sunny renditions of other artists' hit songs on the Fox competition series. A fusion of pop, ska and hip-hop — think Sublime, only dreamier with washboard abs and tousled hair — Emblem3 were pegged as early front-runners but came in fourth place after a surprising elimination (country crooner Tate Stevens won the prize). Pop & Hiss spent the afternoon with the trio late last year while they were still in the running for the $5-million recording deal through Sony Music and "X Factor" judgeSimon Cowell's Syco Music. Even with a few weeks left in the competition, the boys were already plotting what’s next -- with the help of their mentor, Cowell. "Going into the competition, I personally didn't think it would go anywhere," Keaton Stromberg, 16, said a week before the trio was kicked off the show. "I went in thinking, 'Whatever happens, happens.' It's going to get us exposure, no matter what." At the time of the interview, the boys confirmed they had already lined up collaborators for their debut, which will arrive later this year, but said it was too early to reveal details. According to Wednesday's release, a slew of hitmakers has been enlisted for the project, including Benji and Joel Madden (Good Charlotte), Jack Antonoff (fun. ), Carl Falk and Rami Yacoub (One Direction, Nicki Minaj), Peter Svensson (The Cardigans), John Feldman (Gold Finger) and Kool Kojak (Ke$ha, Nicki Minaj). Savan Kotecha (Maroon 5,Britney Spears, One Direction) will executive produce the album, which will be the first release through Kotecha’s Syco imprint, Mr. Kanani. A source close to the group said they’ve also secured a deal with talent juggernaut Creative Artists Agency. The announcement makes them the first "X Factor" finalist to secure a deal outside of the show's winner. Before appearing on “X Factor” the band spent the last year gigging at landmark venues such as the Roxy, Whisky A Go Go, House of Blues and Hard Rock Café. They won Rock N' Road's Orange County battle of the bands in 2011.